Warby Parker co-founder Jeff Raider has teamed up with his old friend Andy Katz-Mayfield to bring a little of that Warby Parker magic to shaving, with the launch of Harry’s. In other words, to take a market that is dominated by a small handful of players pushing artificially priced products (with no respect to the quality of the product), bring it online to help remove the friction and high costs from distribution, give the product a sexier name and look through smarter design, and presto! Success. Of course, Harry’s is not the first to catch on to the web’s ability to enable mass distribution of a sexier product at lower retail prices (better margins) — and capitalize on the magic of viral marketing. Dollar Shave Club has been offering a quality shave for $2/month for over a year now, backed by a memorable, Old Spice-y ad pitch. But the Harry’s founders think there’s still room in the shaving market, especially for those taking the direct-to-consumer approach. Like Warby Parker, by designing, manufacturing and distributing its products itself — essentially creating its own unique supply chain — Harry’s thinks it will be able to offer a higher-quality product at a lower price. After a year spent testing dozens of other products, the founders partnered with German engineers to use a “Gothic arch” model that aims to keep blades sharp without the penchant to become brittle over time, and an industrial design firm to help make sexier-looking handles, reminiscent of classic ball-point pens and/or vintage pens. Harry’s is also using the Warby Parker branding playbook by giving its razors familiar, “people” names; yet, instead of “Chandler” or “Beckett,” Harry’s razors have names like “Winston” and “Truman.” The idea is to give them that boutique, classic feel so that you, the average consumer, believe you’re getting quality without paying an armload. To that point, the company then sells its razors individually (at $10 and $20, respectively) or in sets that come with three blades and shaving cream for $15 and $25. 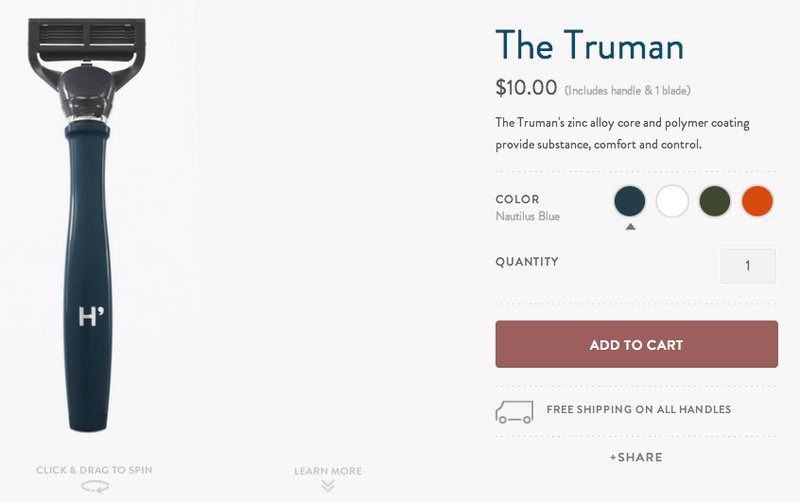 Harry’s is also using the same Warby Parker policy of you-buy-one-we-donate-one to add that feel-good aspect of shopping at their online store. “For every pack of Harry’s blades that you buy, we donate one blade (or an equivalent dollar value) to an organization that supports our mission of helping people to look and feel great,” the website reads. 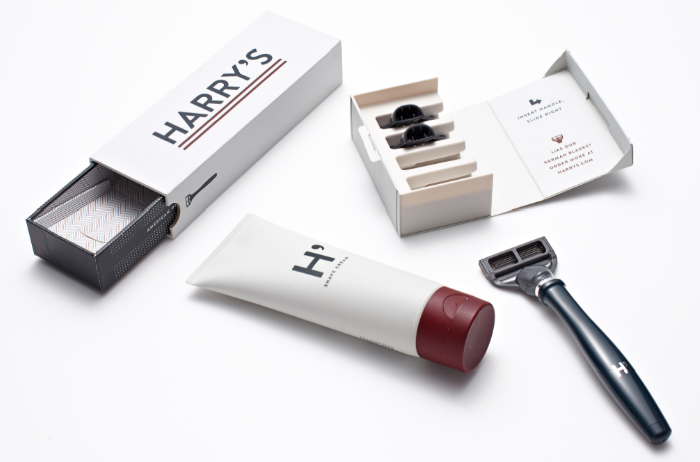 Yet, unlike Warby Parker, Harry’s opts to offer less choice — you’ll only find four products and two different types of razors — in favor of providing a less overwhelming experience for the consumer. Warby is all about enabling choice and personalization for those in the market for a new pair of specs, while Harry’s is just going for a higher-quality product. For shavers, that will either sound bombastic or strike a chord with your inner dude who wants to look cool in the way that a brush and a straight raiser look cool without dealing with the potentially disastrous consequences. There are plenty of similar, inexpensive products out there, so Harry’s is not without competition. Dollar Shave Club, for example, offers its cheapest razor at $1/month, which gets you a handle and two blades, with replacement blades regularly shipped directly to your door. Harry’s isn’t going for the subscription model — and even if its “sets” offer comparable (and in some cases cheaper, depending which blades you’re comparing) prices and three blades — it may lose points with some by doing that. But, considering the inelastic demand especially for the more hirsute among us — a man’s gotta shave — there will be plenty of opportunity to win over those looking for alternatives. After all, how many guys really feel tied to a particular brand of razors? Most just buy the one that’s cheapest and gets the job done without making their face look like it was mauled by a raccoon. So, offering a branded experience that seems hip and purports to be tied to a good cause could seem appealing in juxtaposition for those not tied to Gillette et al. By taking the luxury, modern-design approach, Harry’s may have upped the appeal factor. Although it remains to be seen whether or not the Warby model can work as effectively in the shaving market, if anyone is going to apply the “Warby Parker for X” model to shaving, who better to do it than one of the guys responsible for Warby Parker?